Hisar: A campaign by activist Anna Hazare could enhance the margin of defeat for the Congress in the much anticipated bypoll to the Hisar Lok Sabha constituency and consequently worsen the political problems faced by the ruling party. Analysts say the Bharatiya Janata Party (BJP)-backed Haryana Janhit Congress’ (HJC) Kuldeep Bishnoi, the son of former Haryana chief minister Bhajan Lal, is the clear front-runner in the triangular contest that includes Jai Prakash of the Congress, and Ajay Singh Chautala of the Indian National Lok Dal (INLD). The intervention by Hazare and members of his core team, seeking a vote against the Congress, has not only raised the profile of the by-election but also the stakes for the Congress party. It has forced Congress leader and Haryana chief minister Bhupinder Singh Hooda to virtually camp at the constituency to mobilize cadres. The Hisar bypoll was called after the death of Bhajan Lal, who had earlier broken away from the Congress to form the HJC. The family connection to the constituency made Bishnoi the automatic favourite; a weakened Congress party cadre only enhanced his chances. “Apart from price rise, corruption charges, Hooda and his men have to fight the internal differences in the party, also," said a Congress leader who did not want to be identified. 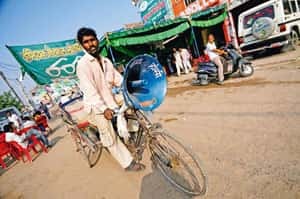 Hazare’s campaign has sought to transform the electoral tussle into a referendum against the Congress and its policies, admitted a Lok Sabha member from Haryana, who did not want to be identified. That makes the election important. “It was not an election for us to win. It wasn’t our seat, but now things have changed. In politics, perception matters," he said. Prakash, who won the Hisar seat in 2004, came third in the 2009 election after Bhajan Lal and the INLD candidate. “It will be a vote against the Congress. People are sick and tired of price rise and corruption. The ruling front has to answer why many of its leaders are in prison," said Gyan Singh, a farmer in Sundernagar, Hisar. While Congress party leaders in Haryana claim they are going to the poll on the development plank, voters question it. “What development? They just sold the state to private companies," said Dharamveer, who runs a shop in Hansi. Hooda, who came into power in 2004 with a landslide majority, lost a lot of ground in the next state election and had to wean away five HJC legislators, excluding Bishnoi, to form the government after the 2009 polls. Congress supporters, however, argue that their rivals are no better. “Both families have made billions from this state," said Shivrajpur, a Congress man, referring to the families of former chief ministers Bhajan Lal and Devi Lal, whose grandson Ajay Singh Chautala is the INLD candidate. Members of neither family could be reached for comment. Nobody is pure, said Rajiv Sharma of INLD. “But we have always worked for the state’s development." Both the HJC-BJP and the INLD claim they will benefit from the anti-Congress sentiment. Ashok Kumar, a local Congress worker, admits the party’s prospects have worsened after Hazare weighed it. Congress general secretary Digvijay Singh on Tuesday wrote a four-page letter to Anna Hazare criticizing his anti-Congress approach in reference to the Hisar bypolls, alleging that opposition candidates were “taking benefit of your clean image to fulfil their own political aspirations". He said in the letter: “When in Hisar, you oppose Congress, then who are you actually seen supporting? Are you not aware of the history of the family of late Bhajan Lal? Is the history of the Chautala family unknown to you." Arvind Kejriwal, an associate of Hazare who belongs to Hisar, argued that Hazare and the team did not support anyone specifically. “We are just saying that don’t vote for the corrupt. Our request is ‘do not vote for Congress because it is the ruling party and it is not letting the Jan Lokpal Bill get passed’," Kejriwal said. Manish Sisodia, Hazare’s close supporter who has been campaigning in Hisar over the past few days, added, “We are not there to give any character certificate to any particular candidate. We are not talking about any particular candidate, we are talking about political parties. Our basic idea of being in Hisar is to talk about the Jan Lokpal Bill." Balveer Arora, former head of the political science department at Jawaharlal Nehru University, said the “consistent campaign" by a popular person like Hazare is a potential threat for the Congress and, hence, the party should evolve an effective counter strategy. Arora, however, added that by joining the campaign in Haryana, Hazare and his team had shed the non-political tag they had claimed. “Once you enter the campaign, you cannot claim that you are apolitical. Now that they have entered the political campaign, the cause on which they had begun their fight on has lost its momentum."